Need an upgraded website? Bridge can help. 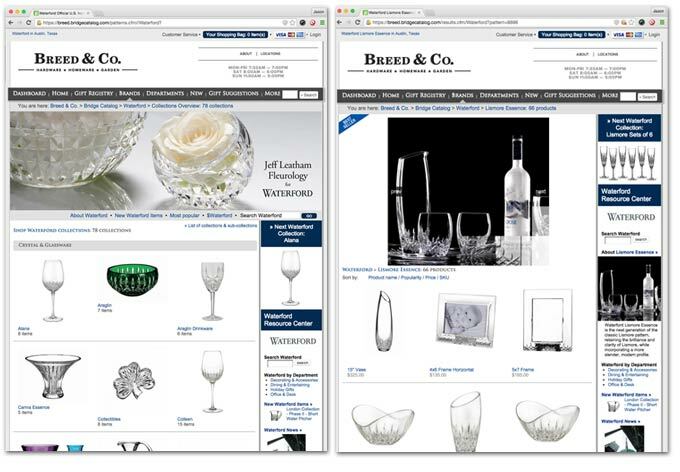 Compete successfully against major online stores. More easily sell products online. Save time and money on updating your website. You can customize your Bridge Store and Gift Registry. You choose the colors and design elements. You can add any products that you wish to this store. Can you add your own (non-Smart Product) items to Bridge Store? 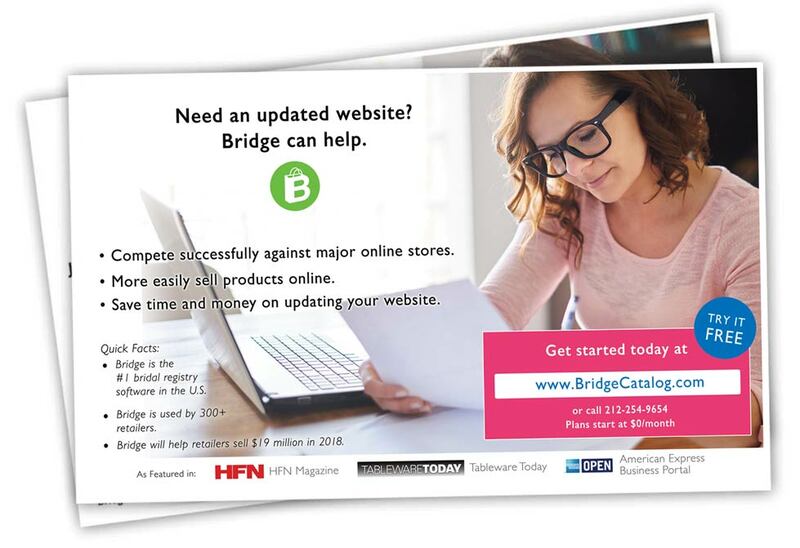 Do you need to pay for updates to your Bridge Store? Can a retailer just sign up for the Bridge Store & Registry and not the Smart Products service? Affordable. Offers your business a free plan. Expensive. No free plan, and most features are costly add-ons. Powerful gift registry software. Immediately offer your registrants best-in-class gift & bridal registry software. The registry is built in and works seamlessly. No built-in registry. Registry software is an add-on from a 3rd-party developer and costs an additional monthly fee. Not seamless. Offer gift cards. Bridge's free plan (and all plans) allow your store to offer gift cards immediately. No gift cards. Offering gift card requires a costly upgrade. Store can't offer gift card at free or mid-level plan. Instantly offer a full online store. Immediately show and sell up to 60,000 products from 110 Smart Brands. Start with an empty online store. You have to spend a lot of time and money to fill it with products. Easy. Allows your business to easily manage 1,000s of products. Difficult to manage products. Interface makes it hard to manage more than 100 products. Since most stores need 1,000+ items to compete online, Shopify doesn't scale well. Dynamic home page. Your Newsfeed keeps shoppers engaged in content, keeps them on the home page longer, and boosts your Google ranking. Old-fashioned home page. Site structure consists mainly of a traditional slideshow and static content. Quickly add brands. Offers your business the ability to add up to 2,000 brands to your site instantly. Hard to add new brands. You have to enter all brands manually, find their logos, and more. Tedious process. Reviews. Your Bridge Store comes with built-in review software. Bridge will help your store collect and share reviews on social media. No built-in review software. Review software is an add-on from a 3rd-party developer and costs an additional monthly fee. Not seamless. Quick setup. Open your store in minutes. Customizable. Add your logo, customize link colors, include your store's picture, and more. Easy for consumers to shop. Free gift & bridal registry software. You can add 1,000s of products to your store. You can add any item from any brand. Your store can instantly sell 1,000s of products from your popular brands via Bridge's Smart Brands program. This saves you time, helps you show more product, and helps sell more product. Software automatically adjusts for easy shopping on mobile phones. Free software updates. Since Bridge gives you free updates, you avoid expensive maintenance costs and update charges. Offer your customers a secure checkout (PCI Compliant). Use Bridge's social network to more easily share news form your most popular brands with your customers. Boost your Google ranking. Bridge has advanced features to increase your ranking. Bridge Store comes with a fully functional gift registry - learn more. How Does Bridge Store Compare to Other E-commerce Platforms?